In polluted lower regions of the troposphere, particularly in urban environments (see Section 3.4), copious quantities of chemical compounds are released into the atmosphere, leading to a number of complex photochemical reactions producing a variety of eye and throat irritants, aerosols and reduced visibility, and other irritating or destructive species manifesting themselves in the general category of photochemical smog. Unlike the notorious smogs (smoke plus fog) that were a part of London life as well as that of many other highly industrial urban areas from the transition to coal in the thirteenth century until massive cleanup efforts were undertaken in the past few decades, photochemical smog is of fairly recent origin. It was first detected through vegetation damage in Los Angeles in 1944 and is sometimes referred to as Los Angeles smog. However, it has now spread to virtually all major metropolitan areas and must be considered to be one of the most pressing actual or potential worldwide problems, with global aspects tran scending national boundaries. Also in contrast to the poisonous so-called London killer smogs,35 to date there do not appear to be major human disasters associated with photochemical smog. However, detailed epidemi-ological studies have shown that the concentrations of pollutants—particularly of ozone but also materials such as particulate matter, the oxides of nitrogen, and volatile organic compounds (VOCs)—are sufficiently high in photochemical smog to pose significant threats to human health, particularly among the very young, the elderly, those suffering from chronic respiratory illnesses, and cigarette smokers. Common symptoms are sore throat, mild cough, headache, chest discomfort, decreased lung function, and eye irritation. Ozone also injures vegetation, leading to reduction of agricultural yield and biomass production. Potentially, photochemical smog can have serious long-range global effects on the earth's radiation balance through submicrometer aerosol formation, and global distribution that may cause unfavorable changes in weather patterns in addition to its influence locally. 35Over 3000 deaths were attributed to the four-day smog in London in December 1952; see Section 3.5. 36Apparently Houston, Texas has joined Los Angeles as having the worst air quality in the United States (Houston air is focus of $20 million study, Chem. Eng. News, Nov. 6, 2000, pp. 32-33). intensity in midday, although hourly variations occur depending on automobile traffic/time distributions and even time variations for different constituents (Figure 5-9). 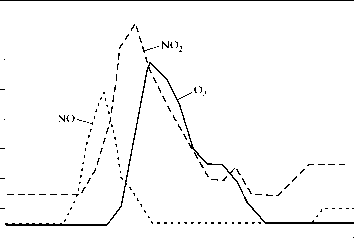 FIGURE 5-9 Photochemical smog buildup in Los Angeles, California, on July 10,1965. Redrawn from K. J. Demerjian, J. A. Kerr, and J. G. Calvert, Adv. Environ. Sei. Technol., 4, 1 (1974). 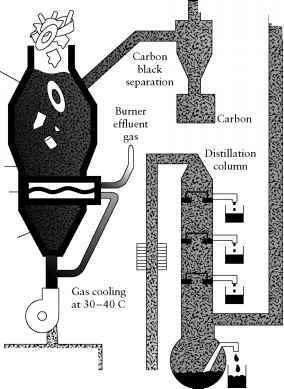 gas-phase (plume) transport behavior that includes topography, and accurate reaction rate data for the many hundreds of individual chemical processes taking place. Reasonable computer simulations generally lump the hundreds of individual VOC contaminants into a manageable smaller number of groups or classes of chemical species with similar structure and reactivity, such as alkenes or aldehydes. Each group is then represented by "surrogate" species.37 In Section 5.3.3 we consider several reactions that are well established as primary steps in photochemical smog initiation in the presence of VOCs and associated generation of the accompanying obnoxious products.